The airline interview process is one of the most unique hiring processes I have ever encountered. One of the methods they use are open group interviews, or “Cattle Calls”. For a Cattle Call, the airline will announce that they are having a hiring session (usually on their website, airline forums, and sometimes in the newspaper). It’s open for anyone who wants to apply; all you need to do is show up with the documents requested in the job posting. Usually that’s something like a photocopy of your passport, your resume, and references. 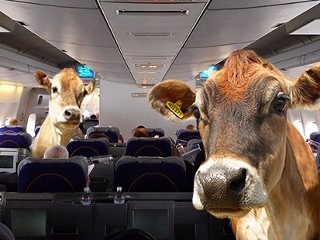 I’m one of those very lucky people who was offered a job by the first airline they applied with, so I’m going to tell you a little about my experience with their cattle call. I found the job posting on my airline’s career site about a month and a half before it was scheduled to happen. This was a huge advantage for me, as it gave me ample time to research exactly what happens at an open interview, to get lots of information about the company, and to get all my materials together. I spent a lot of time learning about the types of scenario questions I might be asked. The airline was holding open interviews all over the country, usually for 3 days in each city. My city was first and I decided to go first thing on the first day… so there was no asking anyone else who went what to expect. I arrived about 15 to 30 minutes before the doors were supposed to open. By this time there was already a crowd of applicants waiting. During my research I had learned that airlines sometimes put fake applicants into the pool to report on everyone’s behaviour when they thought they weren’t being watched. For this reason I sat down next to a random applicant who was also waiting (we’ll call her M) and started chatting her up. We just talked small talk until the company made the announcement that they were ready to start processing everyone for the interview. We all lined up, submitted our resumes, and picked up some papers to be filled out. We were then led to a conference room where we sat, filled out our papers, and waited. M sat next to me and we began chatting with each other and then with those around us. One of the girls I was speaking (Lets call her B) to got called for her interview, after about 30 minutes or so she came back and sat down. We asked her how it was and she said she thought it went pretty well. Right after that they called her out again, and that was it! She was gone. Yikes! Finally after about an hour and a half or two hours (I’m not quite sure, I was actually rather enjoying myself so the time flew right by!) They called my name and it was my turn for an interview. They shook my hand and lead me to another conference room where they were conducting interviews for several people at a time. At my table I had two interviewers. They explained that one, a lovely French Canadian woman, would be conducting the interview while the second, a slightly older gentleman, would just be taking notes. Well I suppose I must have had a perfect personality mesh with both these people because we were talking up a storm during the interview! Along with the standard interview questions that the were required to ask, we’d stray slightly off topic and begin to talk about the airlines operations, achievements, and recent growth (thank goodness for all that research I did!). We also even began to talk a little about our families and told a little joke or two… well more like puns. Luckily we all loved bad puns! After the interview they shook my hand again and told me it was a pleasure meeting me. I was then once again lead back to the waiting room. M was in her interview and our seats were taken, so I choose another seat (one with room beside it in the event that M wanted to sit with me again) and sat quietly for a few minutes going over the events of my interview in my mind to make sure it all went as well as I thought. However that didn’t last too long as I quickly began chatting up the people around me. M returned from her interview as well and sat next to me. Her experience was a positive one as well, although she managed to stay more on topic with her interviewers. Although I was having lots of fun, I was still immensely nervous. I was thinking about B who was called up right after her interview and then never seen from again. That fear began to dwindle as time passed, since she was called up again almost immediately after coming back from the interview. At some point I got up to get a glass of water, and knowing that the company might have people watching, I offered a glass to those around me as well. Another 2 hours or so passed by and again my name is called. I’m told that the airline is giving me a second interview and am taken to yet another conference room. This interview is a one on one with much more in depth questions and even had airline scenarios. During the first few questions I felt as though this interview wasn’t going quite as well as the first. It didn’t have quite the same spark. But then I was given my first of two scenario questions: “What would you do if you are in the middle of a meal service, and a woman with an infant asks you to dispose of her dirty diaper?” Lucky me! I had researched this exact scenario and knew the textbook answer! I’m pleased to say this interviewer loved my answer. He wrote down some notes, looked up, smiled, and said “Do you have a family member or someone who is a flight attendant?” I laughed and told him “I have to be honest with you. I’ve been researching [this airline], and common airline scenarios so that I know everything I possibly can to help me get this position.” Well he just loved that response. From this point on the interview was smooth sailing, partly due to all my in depth research, and partly due to my positive and friendly attitude. The interview ended, and again I was told it was a pleasure. I once again go back to the waiting area. But this time as soon as I sat down my name was called! I instantly thought again of B, this was it and it was over. I’m lead out of the waiting area and am told “We’re giving you a uniform fitting”. A uniform fitting!! This MUST mean I got the job. That was followed by “Now, that’s not a promise” Oh. Well still yay! I passed the second interview and went on to part 3, the fitting! I had the fitting, and was then told I could expect a call in two weeks. And that was it, I’d passed the interviews. I received the call about a month later. I was offered the job on the condition that I pass a medical and training. M had given me her business card and we’d kept in touch. She got the call a week before I did, so prior to hearing from the airline I though I might not had gotten the position. As soon as I heard I gave M a call and gave her the good news, that we were going to be fly buddies.